First, a note: Most of this is prep work- draining the tofu, chopping the veggies, and assembling the dumplings. It’s time-consuming, but worth it for a special meal and not very complicated. 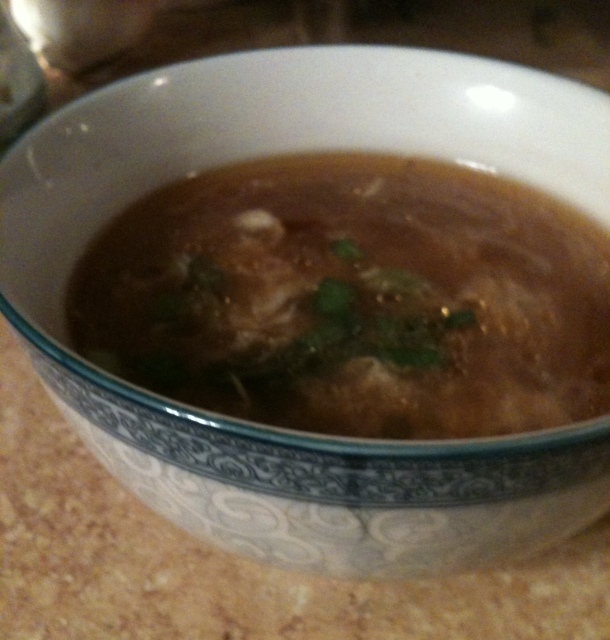 The accompanying recipe, egg drop soup, is much more simple. Slice your tofu block in half (8 oz of tofu). 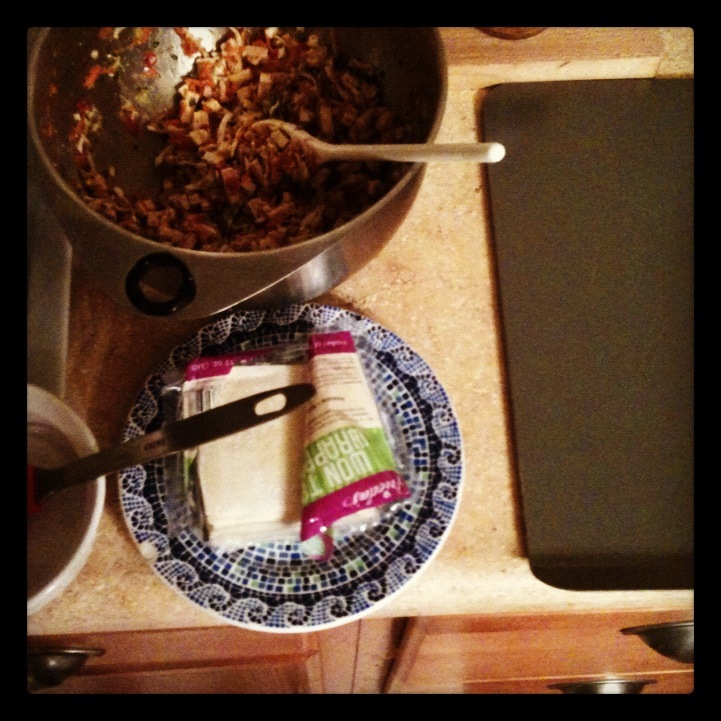 Place two paper towels under, in between and on top of the tofu; place on a plate and top with a heavy bowl, and another bowl or a canned food item on top to help the tofu drain. Let sit 20 minutes. Chop, grate, slice, and dice the veggies- the cilantro, cabbage if you are not using bagged, ginger, carrot, scallion, and red bell pepper. Toss all veggies in a large bowl. When the tofu has drained, dice into 1/4 inch pieces. Add tofu to bowl along with the beaten egg, soy sauce, hoisin sauce, salt, and pepper, and mix all of it up to combine well (the tofu may break up a bit- don’t worry about that). To make a dumpling, brush the four outside edges of a wonton wrapper with water, and moisten your fingers. Water act like glue on these little guys- the more moist your fingers are, the more control you’ll have over the wrapper’s shape and seal. Spoon a teaspoon of filling into the center of the wrapper; fold edges together and crimp over to seal. I folded into triangles and crimped the edges, but there are all sorts of ways to fold them. RasaMalaysia links to a video of how to crimp dumplings on their steamed dumpling page. 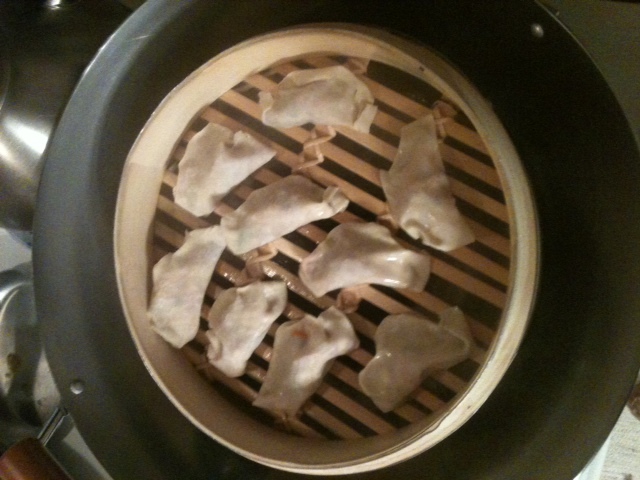 Repeat until all dumplings are stuffed, lined up on the cookie sheet, and covered with a damp cloth. Fill a wok outfitted with a bamboo steamer or a skillet with a metal colander or steamer rack in with a half inch of water, and spray the steamer with a light coat of oil. 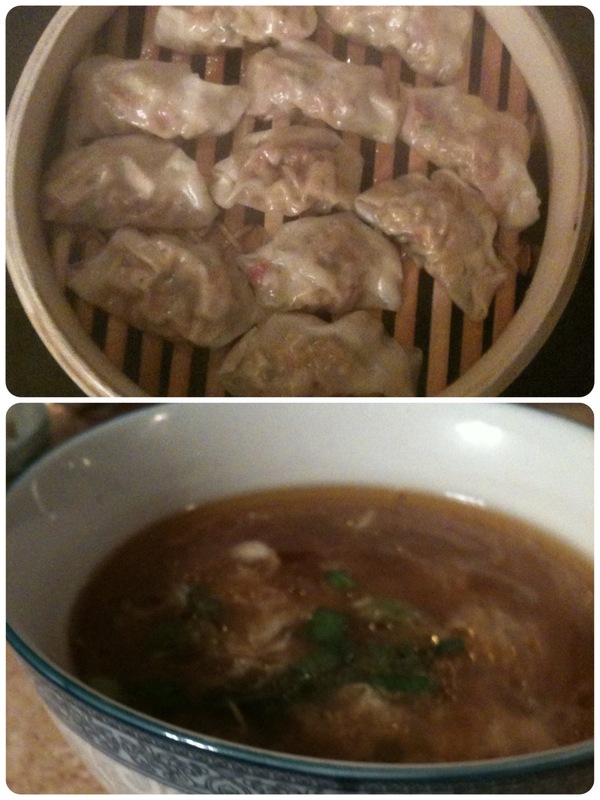 Bring water to a boil, and fill the steamer with as many dumplings as will fit without touching; cover. Steam for 12 minutes per batch until all batches are done, removing finished batches onto another sprayed cookie sheet in a warm oven… or directly into our mouth. You’ll need to add more steaming water as you go. This is so easy!!! After the dumplings chronicles, you’re going to love the two steps this takes!! Great quick weeknight soup- not just for watching fancy awards shows. Bring stock or water and bullion, soy, sesame oil, half of the scallions, and the dash of pepper to a light simmer. Pour beaten eggs into the simmering broth in a slow, steady stream, stirring with a chopstick. Top with remaining scallions. DONE!! All in all, it was a great night. There were savory dumplings and soup, dessert, wine, and my beloved The Artist won best picture!! I hope you have fun making these dumplings. The filling would be so forgiving and easy to modify by adding pork, minced shrimp, other vegetables, etc. Let me know how you make them! next day: best lunch in the office! 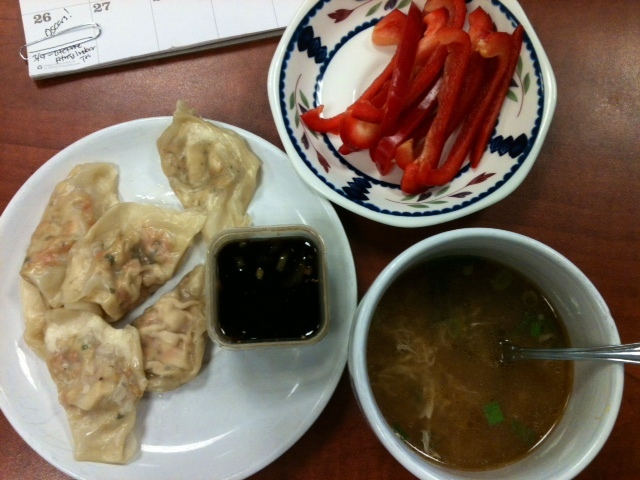 This entry was posted in Classics, Dinner, Eggs, Fancy, Fast, Gluten free, Soup, Vegetarian and tagged Academy Awards, dumpling sauce, easy egg drop soup, egg drop soup, Oscars, Oscars recipe, steamed dumplings. Bookmark the permalink.